Water Temperature – Mid to upper 40′s to 50′s with warming trends. Yes, its officially winter. Air temps in the mid-to-upper 40′s and daytime highs in the low-to-mid fifties. Yep, that’s winter here in Alabama. Often to be followed with next week’s daytime highs that could reach the low-70′s and unseasonably warm nights in the mid-50′s. Yes, that is winter too, here in Alabama. 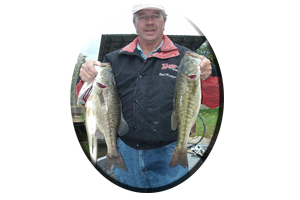 The latter of these two examples the kind of winter, fair weather bass anglers like and the kind of winter weather that always brings the bass of Lay lake up shallow. So you could say, fishing for Lay lakes bass – like the bass these avid anglers pursue – is often found to be both up and down during the winter. One day their up and on another day they are down (or suspended) and regardless of each day’s conditions, there are only so many hours in a good day of fishing. Its often hard to figure out these bass of Lay lake before your time (literally), is up. No matter if your fishing for Lay lake’s largemouth bass (hidden among the many miles of wood cover and various types of aquatic weeds this age-old lake now has to offer), or if your after the ever-moving Coosa River spotted bass, on each outing you have got to adjust to the conditions and figure em’ out fast…before your time is up. If you are a bass tournament angler this equation adds up to plenty of practice time on the water, before the tournament takes place. If your just going fishing (not matter who you are or the quarry your after), your bound to unknowingly do some research on your own, even if you cannot get in some quality practice time. Like merely watching the weather report on Television or searching out current fishing reports on the Internet, or just hanging out at local tackle stores. Taking a good look at the current conditions — and just as important, what took place with the weather as much as two weeks back — is very important in the outcome of your success. Which is catching fish! Always look at each new day with an open mind. Don’t get caught up in your pre tournament practice period and the good results these days often display. Paying attention to the weather the day of your trip, the weather conditions a few days prior to this trip, the way the planned fishing day will unfold (as conditions do often change daily) and even those little often unseen things evident in your surroundings, is very important in your quest for fooling some of Lay lakes bass into biting this winter season. Even the way each bass takes your lure on each new outing this winter season is a lot more important than just catching numbers of bass. Always keep in mind, Alabama’s Lay Lake will present itself to you with a new problem to figure out on each new trip you make. It is a lake unlike any lake I’ve fished, in all my years of exploring every lake in Alabama for over 40 years. LARGEMOUTH BASS , SPOTTED BASS OR BOTH? This is a question often pondered by each angler that’s attempts to fool some good bass during the winter season on Lay lake, a lake 47 miles in length. 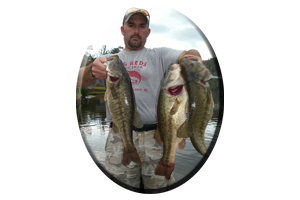 Do you want to spend the day exploring miles and miles of weed lined banks, dabbling your lures among Lay lakes various types of aquatic weeds (some weeds that even thrive well during the winter months), where your quarry is inevitably the largemouth bass? Or would fighting the often swift main lake current in your search for the trophy sized Coosa River spotted bass, be more like your kind of day? Often to many anglers delight they catch both bass species right in the same place. From Lay lakes headwaters, situated right below upper reservoir Logan Martin lake dam, to 50 miles down stream at Lay lake dam, it is possible to fool some very quality sized largemouth bass and spotted bass this winter season. Perhaps choosing a certain portion of Lay lake and thoroughly learning it would be best for first timers. It does take a lot of time exploring every creek and main lake feature this 12,000 acre lake has to offer. Often a lifetime, as I have dedicated my time, as owner of Lay lake’s most well known professional guide service, Reeds Guide Service. 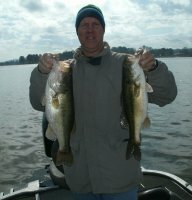 Website: www.fishingalabama.com Breaking down the lake and exploring one section at a time is always a good way to go after Lay lakes wintertime bass. From the Highway 280 crossing, to Lay lakes headwaters — halted by upstream Logan Martin lake dam — is considered Lay lake’s upper lake portion. The river-like conditions (and much smaller feeder creeks than downstream tributaries found here), fish a lot different during the colder months of winter, than during all other seasons. Current, cold water and other often unforeseen wintertime conditions (like heavy rain for a few days), can create a real hit or miss situation in Lay lake’s headwaters. Every trip to the lakes headwaters is an adventure in itself during the winter season. For those anglers that do not frequent these Lay lake headwaters during the winter season, here are a few encouraging words of interest. Make no mistake about it there are some big largemouth bass (some in the 10 pound range) to be found in Lay lakes headwaters this winter season. Spotted bass in the 2-4 pound range are common, with some of the years biggest, trophy-sized spotted bass (those exceeding 5 pounds), taken in these lake headwaters each winter season. Cover, for these bass to call home this winter season is in the form of wood cover, rock cover or bottom irregularities. 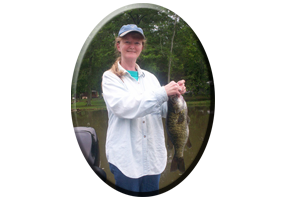 On any cast in these lake headwaters you can catch either a largemouth bass or a Coosa River spotted bass. Again, the conditions you encounter will dictate the lures you use to fool these Lay lake bass this winter season. Mostly stay to your right when you navigate upstream on Lay lake. That’s not hard to remember. * Only when you come to the railroad trestle by the public boat launch do you need to veer your boat to the deeper, left side of the lake. Any island you come to, keep your boat on plane and travel to the right. After passing Kelly Creek, on your left after you go past a big island, you will see Logan Martin lake dam up ahead. * The water is less than 10 feet deep with rocks and laying logs so a slow, idle speed is suggested from here to the small island close to the dam. * Fog can occur in these lake headwaters. Always have your lights on during early morning when fog is usually at its worse. * Floating logs or laying trees are obstacles you should always keep an eye open for when navigating during winter. * Always wear your life jacket and have your outboard motor kill switch attached on any winter trip. From Highway 280 crossing down stream to Gaston Steam Plant (near the town of Wilsonville) is considered the mid lake portion of Lay lake. There are some very visible changes in this portion of the lake. Islands are found right below the Highway 280 bridge crossing. Just below Wilsonville steam plant are more islands. Creeks begin to get bigger and the mouths of creeks and main lake flats both hold schools of bass during the winter months. Mostly spotted bass are found here in the winter months, very active bass, that are right at home around these current-laden islands and creek mouths. But never rule out a big old largemouth bass hanging around all the lakes standing timber, creek mouths, stump rows or laying trees and weedy banks found in this mid lake portion of Lay lake. 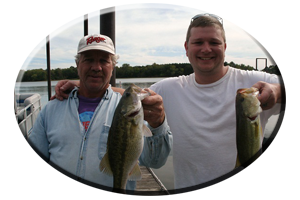 The spotted bass roam in wolf packs and can easily be here today and gone upon your return. The good thing is there are literally hundreds of spotted bass schools with dozens of bass in the 3-5 pound range grouping up and roaming these winter hangout feeding grounds. So having a milk run with a dozen places to hit or rotate in during a days time, may eventually place an angler in the right place at the right time, often during the entire winter season. Aquatic weeds become more evident as you explore the mid to lower lake. They are visible along main lake banks and in some creeks that receive a lot of sunshine, some weeds can still be green in the early part of winter. Largemouth bass prefer these weeds, but the addition of rocks or boulders, ledges or drop-offs and the addition of any type of wood cover such as brush, piers, stump rows, laying trees or logs can attract the spotted bass to current breaks as well. From Wilsonville steam plant to Lay lake dam is a lot of water. Almost half of Lay lake’s 289 miles of shoreline exists here. Feeder creeks widen and main lake flats become more evident with a more lake-like appearance at every twist and turn the old original Coosa River channel makes. Clearly one of the best places for finding active bass during the winter season is around any area featuring warm water. The warm water discharge coming off of Wilsonville steam plant empties right into the main river channel. Boats can be seen all along this bank (with the steam plants towering smoke stacks in the background), on any day during the entire winter season. 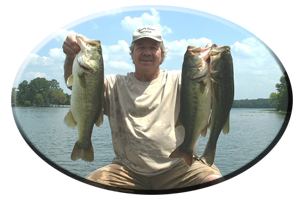 These, boats of all kinds, contain anglers fishing for spotted bass, largemouth bass, striped bass, crappie, catfish, bream and other fish species that all feed in and around this warm water discharge. The warm water can run a mile or more downstream before mixing with the colder, main lake waters. Right below the Steam plant the lake begins to widen. Islands dot the main lake with smaller pockets and incoming creeks evident every mile you travel. Red and green channel markers are clearly visible, many channel markers found along standing timber and stump row drop-offs, places that hold bass all winter long in this mid lake area. Besides the many major feeder creeks to choose from in this mid-to-lower lake region, an angler can fish deep rock bluffs like those found in and around the narrows, main lake points, the mouths of creeks, and more islands found all the way to Lay lake dam. Even major feeder creeks such as Waxahatchee Creek and Paint Creek near Lay lake dam still have standing timber these bass relate to during winter months. Thick, matted weeds and some creeks so big you can spend all day in, are available in this lower lake region during the winter season. Oh, the lures? You will figure em’ out. Make each day on Alabama’s extraordinary Lay lake an adventure this winter season!